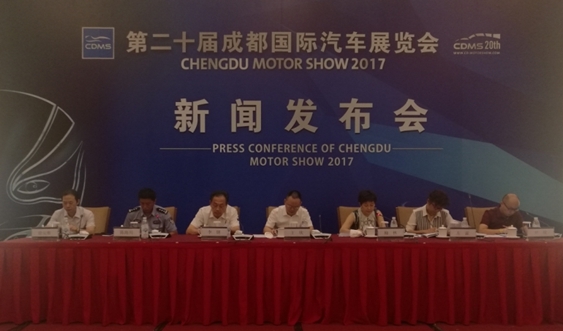 On August 16, 2017, President Li Gang attended the press conference of the 20th Chengdu Motor Show (CDMS). This year's CDMS was co-sponsored by Chengdu Municipal People's Government and CCPIT Automotive Sub Council, and undertaken by Chengdu Global Century Exhibition & Travel Group Ltd, Hannover Milano Fairs (Shanghai) Ltd and CCPIT Sichuan Council. As one of China's 4 major A-class auto shows, this year, CDMS celebrates its 20th anniversary and is scheduled to be held in the New International Exhibition Center of Century City of Chengdu from August 25 to September 3. Themed on "20 years of ingenuity fostering a colorful future", this year's CDMS shall attract 116 domestic and international auto brands to participate, including German, American, French, Japanese, Korean, joint-ventured and self-developed brands. Various models were released including launch edition, limited edition and collector's edition in an exhibition area of 150,000 m2. Meanwhile, the show will present the 2018 world premiere of Maserati Ghibli new model, "Intelligent Mobility & Future" High-end Forum & the 7th Awards Ceremony of China's Automobile Market, old photo collection and photography contest for CDMS and other exciting events. Relevant units including Chengdu Municipal Bureau of Exposition, CCPIT Chengdu, Public Security Bureau of Chengdu, Chengdu Public Transport Group Co., Ltd., Chengdu Metro and 50 media including Xinhua News Agency, People's Daily, China Daily, China Trade News, Ta Kung Pao, Sichuan Daily, Chengdu Daily, Chengdu Commercial Daily, West China City Daily, SCTV, CDTV, Sichuan Broadcasting Station, Chengdu Broadcasting Station, people.cn, Xinhuanet, Sina, Sohu, ifeng.com, Tencent, etc.